The International Academy of Nursing Editors (INANE) presented the AANA Journal with an inaugural Hall of Fame Award at its 37th Annual Meeting on August 7, 2018, in Boston. The AANA Journal was honored for consistently delivering scientifically relevant content for healthcare audiences for decades that promotes patient safety and advances the nursing profession. Managing Editor Larry Sawyer traveled to Boston to accept the award on behalf of the AANA Journal Editorial Committee. During the ceremony a brief history of each publication was given: The inaugural journals are international in scope and cumulatively represent 978 years of scholarly nursing publishing. The volume and scope of the crucial scholarly research disseminated during that time by these publications is truly remarkable. The AANA Journal is the scholarly publication of the American Association of Nurse Anesthetists and publishes timely and relevant research articles, case studies, literature reviews, meta-analyses, and education and resource-related columns that are indexed in all major scholarly databases. and also the AANA Journal staff. Other journals honored with a Hall of Fame Award (with founding year) include American Journal of Nursing (1900); The Canadian Nurse (1905); Nursing Times (1905); Workplace Health & Safety (1943); Nursing Research (1952); Nursing Outlook (1953); International Nursing Review (1954); Journal of Midwifery & Women’s Health (1955); Journal of Nursing Education (1962); Journal of Psychosocial Nursing (1963); AORN Journal (1963); and the Journal of Nursing Scholarship (1966). Established in 1982, INANE is an all-volunteer organization whose members include editors, publishers, and other healthcare professionals involved in the dissemination of nursing knowledge through the scholarly literature. Last week, on AANA Connect, Joshua Newman, MSN, CRNA, announced the launch of the AANA Enhanced Recovery Shared Interest Group (SIG) pilot project. This member-driven SIG has formed around a shared interest in the topic of Enhanced Recovery and its impact on clinical practice, interdisciplinary collaboration and patient outcomes. The SIG wants to engage with AANA members, so visit AANA Connect to learn more and join the conversation! Most CRNAs who recertified or initially certified in 2016 on or before July 31 completed their 2-year Check-in by the July 31, 2018 deadline. However, if you were due to check-in and missed the deadline, log on now and complete this mid-cycle requirement by September 1 to avoid additional fees. Complete your Check-in here: NBCRNA Portal. Not sure of your deadline? See the chart. Not sure when you recertified? Click "verify credential" in the top right corner of the NBCRNA website. Have a question regarding your malpractice insurance coverage? Whether you have a policy with us or not, AANA Insurance Services is a resource to all membership. Contact us today! The most current nurse anesthesia standards, guidelines, and position statements are now available in a new, comprehensive 500-page manual. Ketamine infusion therapy and more. The new manual also includes practice and policy considerations for those in leadership. 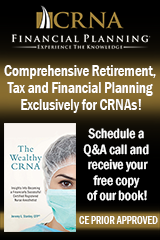 This valuable resource provides everything you need to know about CRNA employment trends. Whether you are negotiating your own salary, benchmarking salaries for your staff, or conducting research, the AANA provides a comprehensive and reliable source of CRNA-specific compensation and benefits data in an easily digestible report. AANA members receive a free 12-page Executive Summary and 50 percent off the full 170-plus page report. Members who have completed the survey are eligible to receive a free electronic copy of the full report. The Johns Hopkins School of Nursing has appointed retired Colonel Bruce Schoneboom, PhD, MHS, CRNA, FAAN, to serve as inaugural associate dean for Practice, Innovation and Leadership. Through this role, Schoneboom will advance collaborations with the Johns Hopkins Health System, particularly in anesthesiology, pain management, and global surgery, and expand practice innovation and leadership within the school’s Doctor of Nursing Practice (DNP) program. Previously the Chief Learning Officer at the AANA, Schoneboom will continue to serve on the U.S. Department of Health and Human Services (HHS) National Advisory Council for Nursing Education and Practice and the HHS Inter-Agency Pain Management Best Practices Task Force. Quick Safety Issue 43: Managing medical device-related pressure injuries builds on Quick Safety Issue 25: Preventing pressure injuries, which provides prevention strategies for and definitions of all types of pressure injuries, based on guidance from the National Pressure Ulcer Advisory Panel’s (NPUAP) Consensus Conference in April 2016. The new Quick Safety offers guidance to help healthcare professionals manage pressure injuries from the use of medical devices. The Alert presents safety action considerations addressing assessment, education, positioning, device care, documentation and communication, teamwork, and continuous monitoring. Spacelabs Healthcare has recalled the Arkon Anesthesia Delivery System due to the system going into a "failed state," during which the mechanical ventilation function stops working, while the machine is in use, or while idle. The firm has not identified the reason for the failed state. For more information, review the FDA recall notice. Vyaire Medical, Inc. has recalled the AirLife Resuscitation Device due to a manufacturing error which may cause extra plastic material in the oxygen output connection to reduce or block the flow of oxygen to the patient. The blocked connection may result in a delay or inability to provide necessary ventilation to the patient and potentially result in serious patient injury, such as inadequate oxygen supply (hypoxia), or death. For more information, review the FDA recall notice. We’re excited to announce that there has been an evolution of the Assembly of School Faculty, the only forum that brings all nurse anesthesia educational programs together in one place to discuss current educational requirements and how they will define the future of the profession. For 2019, the curriculum has been expanded to include a major focus on simulation. Other topics will address the needs of all types of educators—educating millennials, research, technology, and more. A new name has been selected to communicate the importance of having all types of nurse anesthesia educators at the table—Assembly of Didactic and Clinical Educators (ADCE). ADCE will take place on February 13-16, 2019 in Houston, Texas. The “2022 is Closer than You Think: Transitioning to the Doctoral Degree” one-and-a-half-day pre-conference workshop will be offered on February 12-13. Registration for the meeting opens in mid-October. Watch your inbox or social media for details. If you have a strong case for a new business concept, the AANA Sharps Tank on Saturday, November 10, is your chance to present your idea to an expert panel and an audience of your peers. The winner takes home $2,000. See if your business plan sinks or swims on to the final round. Finalists will present their business concept and answer tough questions from our judges and audience to win the first ever AANA Sharps Tank. Because August is Motorsports Awareness Month, Nationwide offers advice on how to make your first NASCAR event more enjoyable. While oral methylnaltrexone promises relief from opioid-induced constipation, researchers wondered if the µ-opioid receptor antagonist would cause opioid withdrawal or in any way interfere with opioid analgesia. They investigated this possibility in a sample population of opioid users suffering from chronic noncancer pain. The estimated 800 participants in the Phase III trial were evenly and randomly allocated into four arms: oral methylnaltrexone at a dose of 150 mg, 300 mg, or 450 mg per day, or placebo. Treatment was administered on a double-blind basis for four weeks and followed up with eight more weeks of the drug as needed. Pain intensity scores, which were comparable at baseline for all of the groups, remained stable during both the initial treatment period and in the following weeks. There was some shift in oral morphine equivalent doses of methylnaltrexone after the four-week treatment period and at the end of the eight-week period, but these were minimal and not statistically significant. Meanwhile, the share of patients who started on a new opioid during the four-week period was similar across the three oral methylnaltrexone groups. Based on the trial results, the researchers conclude that oral methylnaltrexone does not trigger opioid withdrawal or have a measurable impact on opioid analgesia. From "Oral Methylnaltrexone Does Not Negatively Impact Analgesia in Patients with Opioid-Induced Constipation and Chronic Noncancer Pain"
Journal of Pain Research (08/18) Vol. 11, P. 1503 Webster, Lynn L.; Israel, Robert J. Peripheral nerve blocks could offer deliver prolonged relief to patients whose severe facial pain from Trigeminal Neuralgia (TGN) is not well-managed with medication. In the American Journal of Emergency Medicine, Boston University School of Medicine's Michael Perloff, MD, describes a case series involving nine patients with the condition. All experienced immediate relief following treatment with Peripheral Trigeminal Nerve Blocks (PTNB), and most reported being pain-free. Six of the patients continued to benefit for one to eight months after PTNB, including two whose pain was completely resolved. "PTNB can be a simple, safe alternative compared to opioids, invasive ganglion-level procedures, or surgery," according to Perloff, who believes the technique has merit. From "Peripheral Nerve Block Provides Some with Long-Lasting Pain Relief for Severe Facial Pain"
Evidence linking unplanned intubation (UE) to delirium, reintubation, and prolonged hospitalization continues to mount. The latest findings were presented at the 2018 Society for Critical Care Medicine Congress by Nicholas Watson, MD, of Michigan State University. The anesthesia provider was lead author for a retrospective, multisite study involving 94 patients with UEs plus matched controls. "The most important finding," according to Watson, "is that unplanned extubation was associated with delirium as determined by confusion assessment method for ICU [CAM-ICU]." The preliminary results also indicated that delirium was more probable on CAM-ICU in the 24 hours before extubation in the UE patients than in the control group. In addition, reintubation was 3.8 times more likely among the UE patients; and, compared with controls, they more frequently required physical restraints during the 24 hours leading up to extubation. Watson reported that continuous infusion sedation with dexmedetomidine also was more prevalent in UE patients. The researchers called for more study of the factors involved in UE. "Caution is indicated here," Watson remarked, "because it is not entirely clear whether these factors contribute to UE or are simply consequences of the pattern of care we typically provide to patients prone to UE." From "Delirium Associated with Unplanned Extubations"
The Lancet has published new evidence that giving remifentanil to women during labor reduces their need for an epidural. The multi-institutional study involved U.K. patients aged 16 and older, who were randomized to standard opioid pain relief with pethidine or to remifentanil. In the final analysis — which included 154 and 186 mothers, respectively — more than twice as many women in the pethidine arm eventually received epidural. The rate of switchover was 19 percent for patients given remifentanil versus 41 percent for patients given pethidine. Additionally, mothers in the reminfentanil group rated their pain lower and were less likely to require instrumental delivery. While remifentanil currently is offered in the U.K. only when epidural is medically unadvisable, the study authors believe its use should be expanded. However, they agree, more attention must be given to the drug's effect on maternal oxygen levels. Although it caused negative effects in neither mother nor baby, about twice as many laboring women taking remifentanil suffered low oxygen levels and needed supplemental oxygen than did those receiving pethidine. From "Intravenous Remifentanil Patient-Controlled Analgesia Versus Intramuscular Pethidine for Pain Relief in Labor"
The Lancet (08/13/18) Wilson, Michael J.A. ; MacArthur, Christine; Hewitt, Catherine A. Findings from a systematic review suggest a benefit in using sodium bicarbonate-buffered lidocaine over nonbuffered lidocaine in the dental setting. When performing inferior alveolar nerve block, results from the 11 studies analyzed show that buffered lidocaine achieved onset 48 seconds faster than nonbuffered formulations. In addition, buffered lidocaine appeared to lower pain scores on a visual analog scale versus nonbuffered lidocaine. Reporting in the Journal of Dental Anesthesia and Pain Medicine, the researchers acknowledge the low-to-moderate quality of the evidence. Further study with large sample populations and low risks of bias is needed to verify the findings, they conclude. From "Buffered Lidocaine May Be Superior to Nonbuffered Lidocaine for Inferior Alveolar Nerve Block"
Researchers investigated whether limiting sedation levels during spinal anesthesia might affect postoperative delirium in a population of older adults undergoing non-elective hip fracture repair. The Johns Hopkins-led team recruited 200 participants aged 65 years or older, who were randomly assigned in a 1:1 ratio to lighter or heavier propofol sedation. The risk of incident delirium was 39 percent in the heavy sedation group and 34 percent in the lighter sedation group, for a difference that was not considered statistically significant. Between-group differences became significant, however, when patients were stratified by Charlson comorbidity index (CCI) baseline score. In this subset analysis, patients with low CCI who were exposed to heavy sedation were twice as likely to develop postoperative delirium; but patients with CCI above zero were unaffected by sedation level. The findings from the STRIDE trial suggest that intraoperative sedation levels could be adjusted to avoid this complication in certain patient populations. From "Effect of Depth of Sedation in Older Patients Undergoing Hip Fracture Repair on Postoperative Delirium"
JAMA Surgery (08/08/18) Sieber, Frederick E.; Neufeld, Karin J.; Gottschalk, Allan; et al.